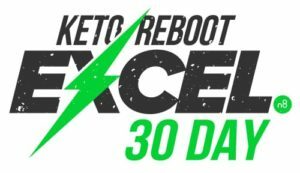 After conquering the 60 hour Keto Reboot, the 30 Day Keto Reboot Excel is the next step for total metabolic optimization. 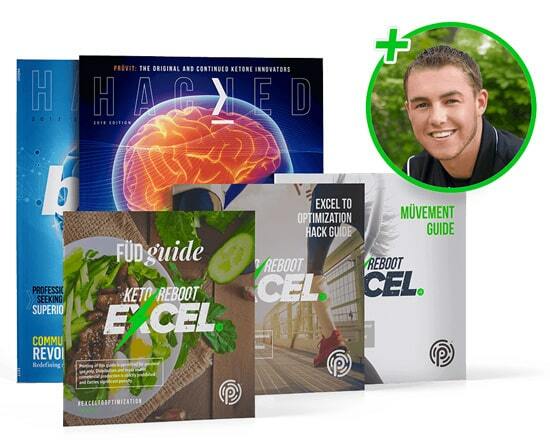 The 30 day Keto Reboot Excel is a program that is designed to give you the consistency required to reset your body’s metabolism for total optimization. First, it starts by jumpstarting your metabolism and depleting your glycogen stores with a 60 Hour Keto Reboot cleanse. And then, rather than falling back into unhealthy eating habits, you carry on your journey with keto supplements and expert coaching that will be your metabolic boss over the next 30 days. You already have momentum, so now OPTIMIZE your body for BETTER! Note: Product flavors may vary from month to month. A total value of $439 – Yours for just $339! A total value of $1134 – Yours for just $10! Price is $374 USD in Canada and Australia. Please note, product flavors may vary month to month. 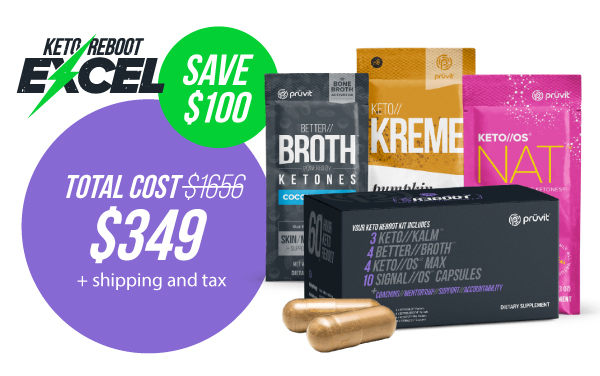 In the 30 Day Keto Reboot Excel Pack, not only do you get amazing top of the line keto products from Pruvit, you’ll also get an array of coaching tools and resources that are valued at over $1000! Hacked Magazine is the go to source for the latest news and information surrounding ketone technology. It is full of helpful and informative articles on how to “hack” the keto lifestyle. As well, you’ll find interviews with top fitness and diet experts in the industry, and plenty of research studies. The Digital Füd Guide and Müv Guide will inform you on what foods are good to eat and what to avoid, as well as step by step exercises to keep you moving. Every week you’ll receive 2 virtual coaching tips to your email inbox. These tips will come at just the right time to help you along your journey. At last but not least, you’ll be joining laser coaching zooms with Dr. Ryan Lowery, where he will be focusing in on your progress and giving feedback on how to optimize your experience. Dr. Lowery is a well known thought leader in the ketogenic community and is one of the researchers behind Pruvit’s proprietary ketone formulas. 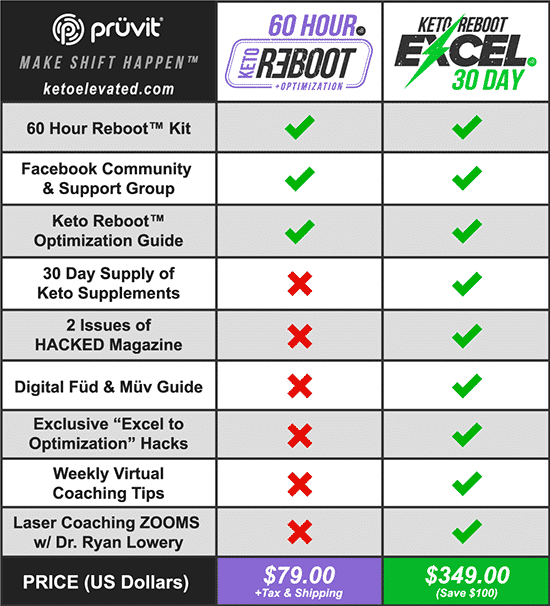 If you are not ready to commit to the full 30 Day Keto Reboot Excel program, you can simply start your path to optimization with the 60 Hour Keto Reboot cleanse for only $79. DISCLAIMER: The information contained herein is not intended to be a substitute for professional medical advice, diagnosis or treatment in any manner. Always consult a qualified medical professional before beginning any nutritional or exercise program. Never disregard professional medical advice or delay in seeking it because of something you have read that is published by Prüvit Ventures, Inc. Always seek the advice of your physician or other qualified health provider with any questions you may have regarding any medical condition. 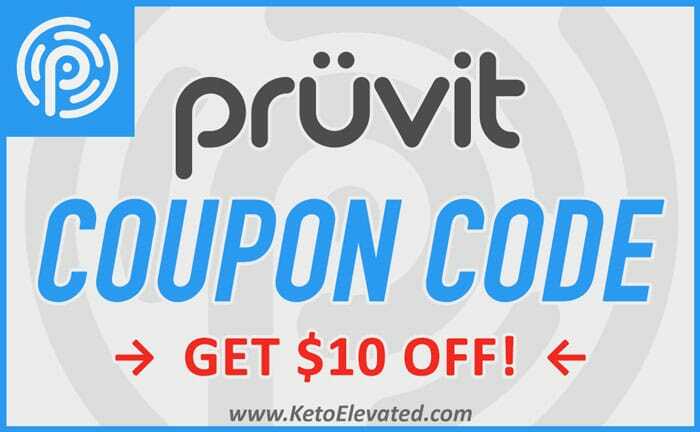 The information provided by Prüvit Ventures, Inc. relating to the 30 Day Keto Reboot Excel is for informational and educational purposes only and, any use thereof, is solely at your own risk. The Keto Reboot enhancement strategies should not be applied unless a complete examination by a qualified health-care professional has first confirmed that the health condition of the individual can tolerate the related programs and goals, and support the enhanced metabolic performance.